In the last post we saw that the first fundamental form was an inner product on the the tangent space , and we used this to study the intrinsic geometry of surfaces. The goal of this post will be to understand the differential of the Gauss map, which we will use to define Gaussian curvature and the second fundamental form – a quadratic form on the tangent space . We will start by defining the Gauss map, which we have already seen in class. I will give a few examples/exercises in which we actually compute some of these. We will see that the differential of the Gauss map is a self-adjoint linear map, and the second fundamental form is the associated quadratic form. The Gauss map very much depends on how the surface is sitting in , i.e., on its parametrisation . The remarkable fact is that the Gaussian curvature, which we will define in terms of this Gauss map, is an intrinsic property of , that is, it doesn’t depend on the specific embedding . This is the statement of Gauss’ Theorma Ergergium. Indeed, is basis for , and the cross product (see last post) gives us a vector perpendicular to both. The map is differentiable, and we say we have a differentiable field of unit normal vectors (on the image ). There has been some confusion in class over the definition of orientable. 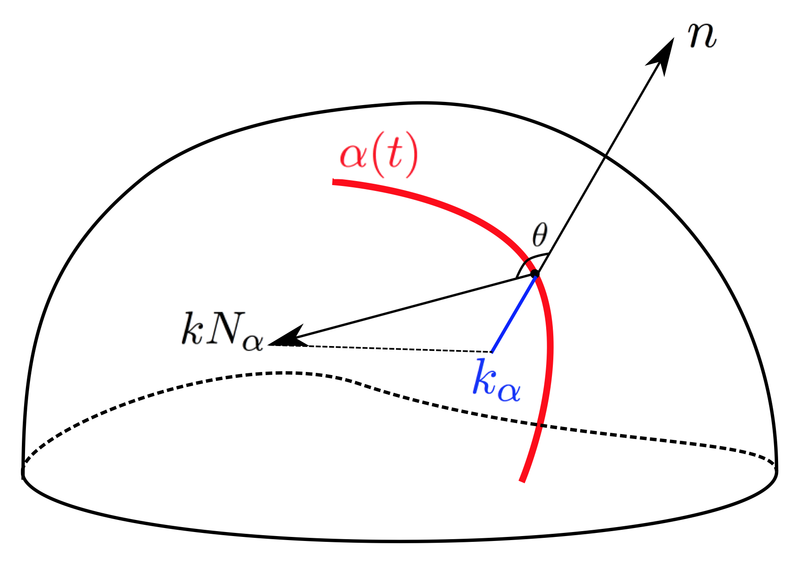 For us, an orientable surface is one that admits a differentiable field of normal vectors on the whole surface , and we call a choice of such a field an orientation of . Remark. Given an orientation of , we get an induced orientation on each tangent space as follows: call a basis of positive if is positive. Now the set of all positive bases for is an orientation of . taking a point to the normal vector . Exercise. Compare with . Aren’t they similar? This is an important idea and we will come back to it. In your prelim you were asked to compute a Gauss map. Let’s look at a few examples. Each time we can think about the above exercise. 1. An easy example is the plane . The unit normal vector is constant here, so for all . Notice that is parallel to . or if you prefer, let be a parametrized curve on and observe that and thus . This shows that either or are normal to on (outward and inward pointing normals, respectively). and are eigenvectors of , and you have just computed their eigenvalues. 3. Exercise. Compute the Gauss map for the unit sphere using the same method as above. You should have seen the following in 2230, so this is just a quick recap. Let be a vector space with an inner product . We will be thinking about with the first fundamental form. Definition. A linear map is self-adjoint if . Exercise. Fix an orthonormal basis for . Show that the corresponding matrix for is symmetric. Conversely, if is a symmetric bilinear form then one can define a linear map by , and it will be self-adjoint. Theorem. Given a self-adjoint linear map , there exists an orthonormal basis for such that the corresponding matrix for is diagonal. Moreover the eigenvalues of this diagonal matrix are precisely the maximum and minimum values of the quadratic form on the unit circle of . Exercise. finish the proof. Hint: take derivative of with respect to and of with respect to . We thus have an associated quadratic form . It turns out to be more convenient to use . Definition. The second fundamental form is defined on by . It is the quadratic form associated to self-adjoint linear map . I first describe the normal curvature of a regular curve in . 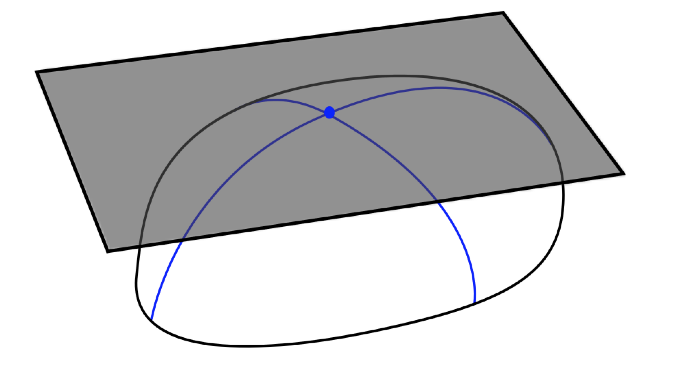 Recall (or perhaps this is a new definition) that if is a curve (parametrized by arc length ) then is the curvature of at . 1. Show that the the curvature of a straight line is 0. 2. Show that in general is normal to . Hint: consider the expression . Let be a point on , the curvature of at , and let denote the (unit) normal vector to at ( ). Then we have that , where is the normal to the surface at . Definition. The normal curvature of at is . It is simply the projection of to . So the second fundamental form of a vector is the normal curvature of a(ny) curve passing through and tangent to . In particular this tells us that any two curves passing though a given point with the same tangent have the same normal curvature at that point (this is known as Meusnier’s theorem). We have shown that is a self-adjoint linear map – and so we can apply the theorem stated above to conclude that there exists an orthonormal basis of such that is diagonal, that is and , and moreover, we know that (WLOG) is the maximum value of restricted to the unit circle in and is the minimum. That is, and are the extreme values of the normal curvature at the point . We can picture this as follows: fix a point , and consider all possible unit tangent vectors at that point (a circle’s worth of them). For each choice of vector we find the normal curvature of a(ny) associated tangent curve, we pick out the maximum and minimum values we find around the circle, and call them and . Definition. and are called the principle curvatures at , and the directions of their corresponding eigenvectors and are called the principle directions at . 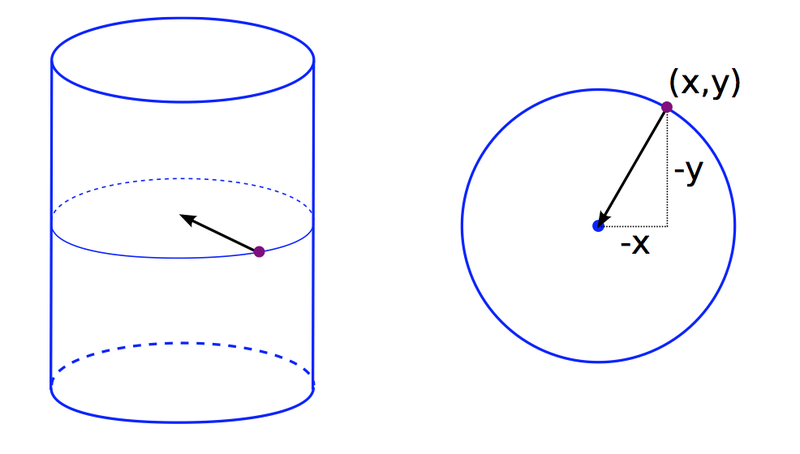 For the plane or the sphere all directions at any point are extremal, and so all directions are principle directions. In particular . Thought. Can you think of another surface with this property? For the cylinder we showed that the principle curvatures are 0 and 1. In the specific example we covered, the principle directions at any given point are parallel to the z-axis (corresponding to the minimum normal curvature, 0) and parallel to the xy-plane (corresponding to the maximum, 1). We know that the determinant and the trace of linear map are independent of the choice of basis, and therefore we have that and . Exercise. What would happen to the determinant and to the trace of if we were to change to orientation of ? Do you think this would be the same if we were considering 3-manifolds? What about n-manifolds? Here are some terms you may have come across before that relate to this point of view. Hopefully it is clear that this classification does not depend on the choice of orientation of . Exercise. Give examples of a points on surfaces satisfying each of 4 definitions above. Let’s recap what we just saw. The fundamental construction was the differential of the Gauss map which was defined in terms of the Gauss map which itself we defined in terms of the parametrisation . This is an important observation – the second fundamental form very much depends on the specific embedding of . We also can see that the principle curvatures depend on the embedding. So unlike the first fundamental form, which was used to describe the intrinsic geometry of , the second fundamental form is used to understand its extrinsic properties. It is in this setting that Gauss’ theorem really does seem remarkable. Indeed, Gauss’ theorem tells us that is an intrinsic property of , that is, does not depend on the choice of . Indeed, the Gaussian curvature, and Gauss’ theorem is precisely that is an intrinsic property. where are the coefficients of the first fundamental form. Similar expressions exist for the mean curvature and principle curvatures for example.